Last week I recovered a friend’s mp3 library from a 2nd generation iPod. All was well except for that fact that any music put onto the iPod is given a random file name such as C00XY.mp3. Not helpful. After scratching my head and thinking that we would have to rename most of the files manually, I started to look for re-tagging programs. A few were recommended on the internet but I found them to be too unwieldy or didn’t quite work right. Thankfully, I discovered a lightweight tagging application called Ex Falso. A fairly simple to use tool which easily re-tags your music, or renames the files with much more ease than any others that I have come across. It only took a few minutes to read the tags of around 3500 songs and rename them all. As an added bonus – it also fixed tags of .m4a audio files, meaning that preparing music to go on my iPod Touch in Linux is slightly easier. Wehey! I upgraded to Ubuntu 8.04 Hardy Heron over the weekend. The process was relatively painless, and some of the upgrades made little, but nice, improvements. 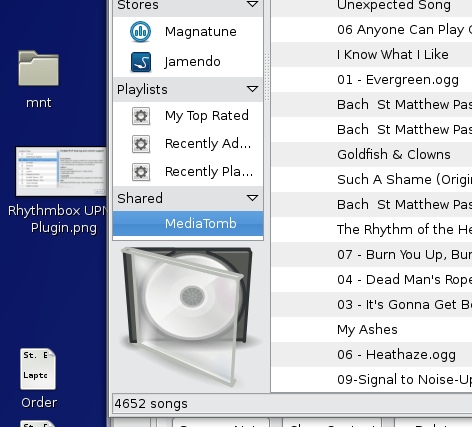 Finally, the UPNP media rendering functionality in Rhythmbox is working! Once installed, fire up Rhythmbox, and click on Edit > Plugins. Once there, tick the box for DLNA/UPnP to enable UPnP. Click Close and you should see a new shared tab on the left, which will list your network UPnP servers. It’s somewhat limited in that it doesn’t present you with the various folder views that other media renderers will – but at least you can pick out music from network devices. It seems that this is old news generally, but I found Mario Paint Composer on the Internet yesterday. It was actually due to a YouTube video (why the hell I ended up looking at a Rick Astley song I still don’t know). Of course, there is not one but two composer programs emulating the features of Mario Paint. The other is Mario Sequencer, which was originally written in Japanese. Luckily the website hosts an English version. I’ve found that sequencer seems to have better timing, but Composer has a slightly nicer interface. I was musing on being able to use this in schools as a basic synthesizer for primary kids. It has everything they need, such as tempo and different sounds. Most importantly, the sounds are fun and absurd. The one thing that I’ve noticed about Marillion’s recent album release, Somewhere Else, is that it provides Marillion with the opportunity to release pun-tastic releases based on the original album. ‘Something Else’ was the bonus DVD, there’s the forthcoming ‘Snow-where Else’ Christmas tour. I’m sure that the ‘making of’ CD will probably get called ‘Nowhere Else’, and the live album will be dubbed something like ‘Somewhere on the Road’. It’s not a bad title to say the least, and captures the content of the title track brilliantly. What I’ve found, however, is that I’ve had to be, musically, somewhere else to give it a fair review and ponder my thoughts on the new album. When I first listened to it, the sound pumped from my stereo crashing into my dining room like waves at high tide. This album wanted to make sure that its presence was felt. Not only that, it made sure you noticed (as far as Marillion albums go anyway). ‘The Other Half’ is the opener and allows Marillion to tighten up some riffs and let Ian Mosely crash out with the splash cymbal. It reminded me of the first time I listened to Genesis’ ‘And Then there Were Three’. I could hear counterpoints in the melody courtesy of Mark Kelly and Steve Rothery and Pete Trewavas ploughed the song home like they are on ram raid. It’s a fine track that has it’s own other half. Halfway through the song it turns into the moral of it. It seems somewhat trite, but still good, and is one of the strongest tracks on the album. Steve Hogarth calls the song home by repeating the line ‘the other half’. Something that bizarrely happens in a number of songs, in which either h ran out of words, or decided repeating the titles or phrases a lot is more effective. ‘See it Like a Baby’ slides in as the first single from the album. Not a bad song. There are five distinct lines in the song, one repeated over and over. Musically, it’s wonderfully subtle during the verses – it’s just a shame that it feels like it’s dragging on. Even the guitar solo sounds a little repressed – almost as though the impact of the song drags it down. Still in single-town, ‘Thankyou Whoever You Are’ starts up with a piano / vocal style reminiscent of Enlightened from marillion.com. Then the chorus bursts on, and Hogarth plays with the repeating lyric idea (again), soaring with the title of the song. There’s song great key changes in the verses, which help to keep the song interesting. The chorus itself is dynamic with Mark Kelly’s keyboards providing strings that allow h’s voice to soar. Rothery cuts in with a solo against a backdrop of syncopated drums and rolling piano chords. It’s crisp and clear. And then another chorus and the song gently plays out. A fine track but not their best. Some have also argued that the lyrical theme is somewhat trite. ‘Most Toys’ then bounds into view. If you can imagine some drunk smashing through your window, getting up, the proceeding to stumble around destroying things in his wake, then this would be the musical equivalent. It’s loud, samey, and ultimately dull. The theme is the compulsory Marillion ‘trappings of fame’ song that appears on nearly every album. I have no problem with that, though. ‘King’ is the quintessential ‘trappings of fame’ song on Afraid of Sunlight. This is a coarse and brash song. The fact that the title track is next has me immediately reaching for the next track button. Now we have the singles out of the way, we are treated to ‘Somewhere Else’ itself. I’m glad that they decided to use this title rather than its working title. I feel it captures the feelings of isolation perfectly. I really like Marillion’s use of piano throughout this album. It creates a clear, crisp sound that only enhances the sounds of the other instruments. It shows on this song. Once again, a song of two halves, the centre section has what I can only describe as an irksome line, “Mr. Taurus ate a thesaurus…” I played SE to a friend, and as he caught this particular section of this song, he turned to me and said, “That’s terrible.” I’d pretended it was artistic, but ultimately couldn’t refute it. Which is a shame because there’s some great lines following that. Then the song launches into a crescendo of sound as h launches into the closing section of the song, everything rising in pitch and volume and then… then… nothing. Unfortunately the song seems to abruptly stop, and we don’t hear the great ending that we hoped for. Such a shame. You could almost believe that Tori Amos penned ‘A Voice from the Past’. A repetitive piano phrase changing in key with a morose h singing over the top. I really liked this song until I saw it live. I wont go on about it, but I don’t need the sloganeering that was projected onto the back screen of the gig. It suddenly dawned on me that h was Bono-incarnate and I really went off the song. Musically it is wonderful, sounds swimming with gentle movements and light touches of percussion. It lifts in the third quarter as h shouts “Enough is enough,” and the music builds. It’s really great. But lyrically it leaves me cold. ‘No Such Thing’ finds h stuck on the toilet as he sang this. There’s a peculiar submersive echo that is used throughout the song. Personally, I feel that it adds some depth to the song, but the song itself feels too tempered. My favourite misheard lyric in the album is here: “There’s no such thing as something something”. Some fine music here, but even the bridge doesn’t raise it highly from its monotony. Ah, something definitely new and different from Los Marillos here as ‘The Wound’ winds up and spits out any preconceptions about Marillion’s music. Bass and drums rumble through as h shouts over the top about the wound, and just as you think you’ve got the song, it quickly changes into a haunting melodic track without the listener even noticing. The music resonates with the lyrics nicely. It’s something so different it took me many listens before I started to ‘get’ this track, but it’s definitely worth it. I first heard ‘The Last Century for Man’ at the Koko. I remember thinking, “God, I hope this isn’t typical of the album.” Luckily it wasn’t. Outside The Forum in London, a guy asked, “What’s all this nonsense about God Bless America and all that crap?” A woman told him it was meant to be ironic. But not ironic enough for me obviously – or maybe a little too much. I really have trouble bearing the cumbersome lyrical theme, which is a shame as the music is the exact opposite – sublime, considered. The cacophony at the end is merged well – but is it really necessary? I don’t know. But the song is over soon enough. ‘Faith’ has been knocking around for about 6 years now. It was actually played at a Marillion convention before Marbles was released, but never made it to Marbles itself. I’m glad, as it feels like a whimsical, and somewhat half-cooked effort that has suffered from too much work, yet not enough substance. h’s voice croaks through this semi-acoustic meandering wannabe ‘Made Again’, and then some bounding bass and horns crash through and upset the balance some more. Unfortunately, the song sounded as good as it was going to get on the ‘Bootleg Butlins’ DVD. It wasn’t too bad there, but this really isn’t the place for the song to live. One thing that struck me is the return of ‘mumbly h’. Steve Hogarth seems to have gradually developed this mumble that makes most of the lyrics incoherent. This first became noticeable on tracks such as ‘The Invisible Man’ and ‘Fantastic Place’ on Marbles. It was used to good effect. Here it is overdone. Sonically, the music really comes through. The Marillion ‘sound’ feels more stripped down, and that serves it a great justice as at any point you can pick out what’s being played. It’s a refreshing change to the production of ‘Marbles’ and the over-production of ‘Anoraknophobia‘. But ultimately the album feels disjointed, being a collection of songs that fail to reach their potential. SE is an album that also suffers from following ‘Marbles’ 3 years later. Marbles is an epic and brilliant Marillion album. Every track shines. When you typically listen to a Marillion album, you know that you’re listening to something special. Marillion are and always have been more than the sum of their collective parts. Here, something seems to have held the band back, and resulted in a good album. A good album, not a great album which is what I expect from Marillion. Sorry, guys!